Their name might be shocking, but the Stop Killing Cyclists campaign group certainly know how to capture attention. 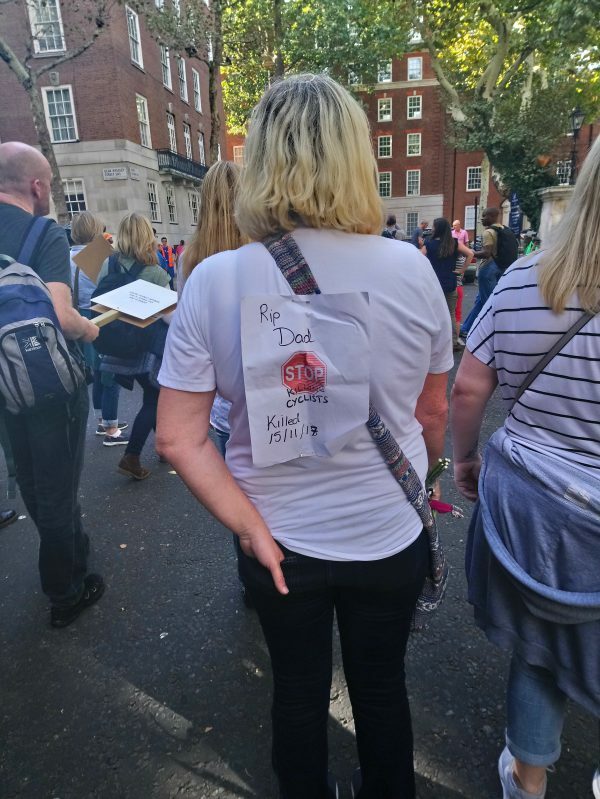 The London based campaign group take their initiative from the Dutch movement of the 70s called ‘Stop de kindermoord’ (stop the child murder). It’s certainly a direct approach to campaigning but their peaceful protests get results that we all benefit from. 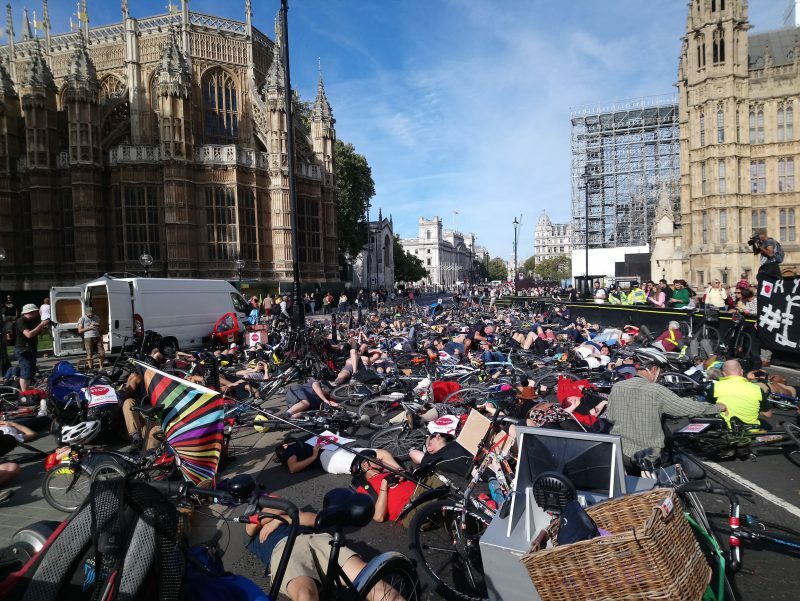 We heard that they were organising a “National Funeral for the Unknown Cyclist” and given the recent spate of tragic cycling accidents that have happened in London, we completely agree with their calls for the government to set aside £3Billion build a national protected cycle-lane network. 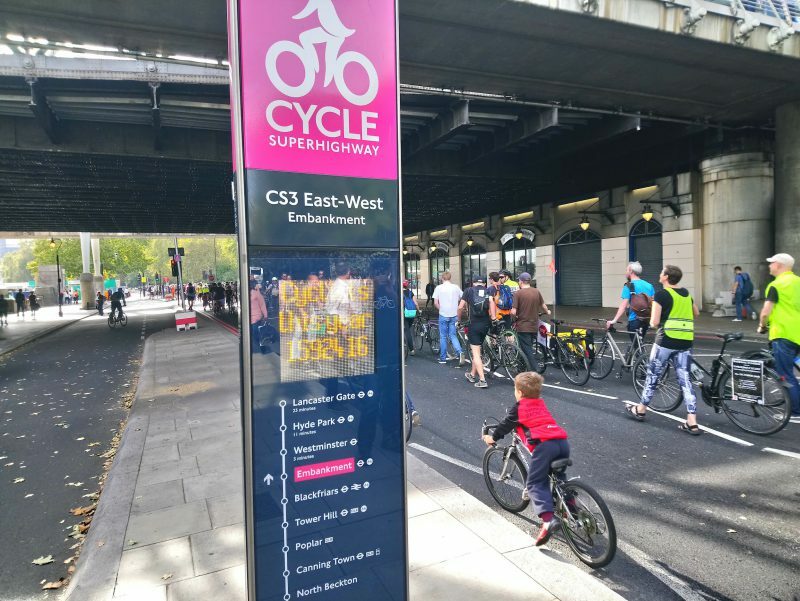 That may sound a lot but bear in mind that the new East London car tunnel under the Thames in Silvertown will cost £1Bn to increase congestion in another part of London and you realise that spending £3Bn to get the UK more active will save fortunes in the long run with cleaner air and a more healthy population. 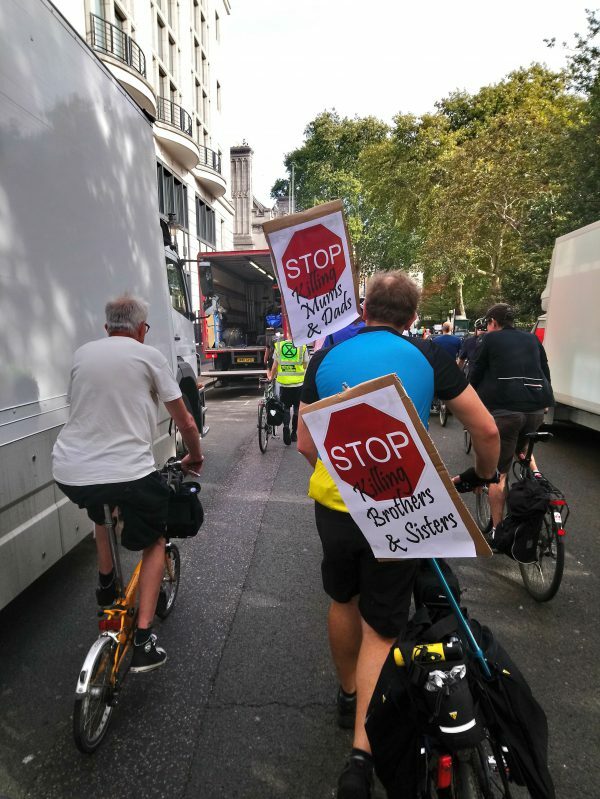 We set off for the meeting point at Holborn’s Lincolns Inn Fields and were amazed to see how many other cyclists had given up their Saturday afternoon to come out and make their voice heard. 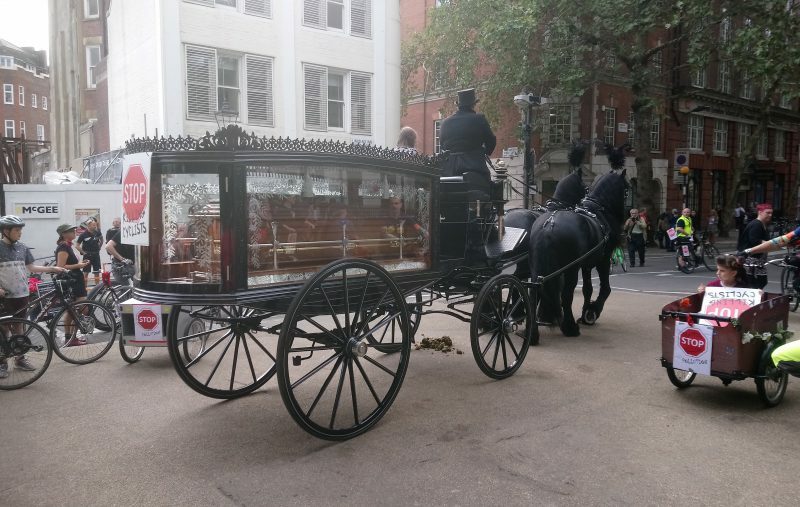 The organisers had certainly pulled out all of the stops – at the front of the parade there was a horse drawn funeral carriage complete with a coffin. Following it was the loudest cycling sound system I’ve ever heard playing some sort of bagpipe lament. The procession set off at a walking pace and we made our way down to the Embankment and on to Parliament. £3Billion is not a lot of money when you realise the cost savings to the NHS from having a more active population. The Pedal Me bike taxis and delivery service were out supporting. 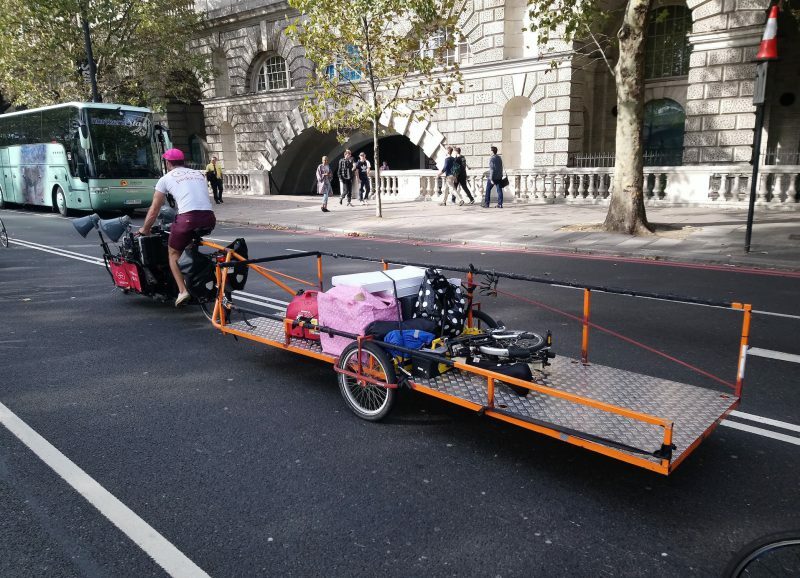 I hadn’t seen a cycle trailer as large as this before. 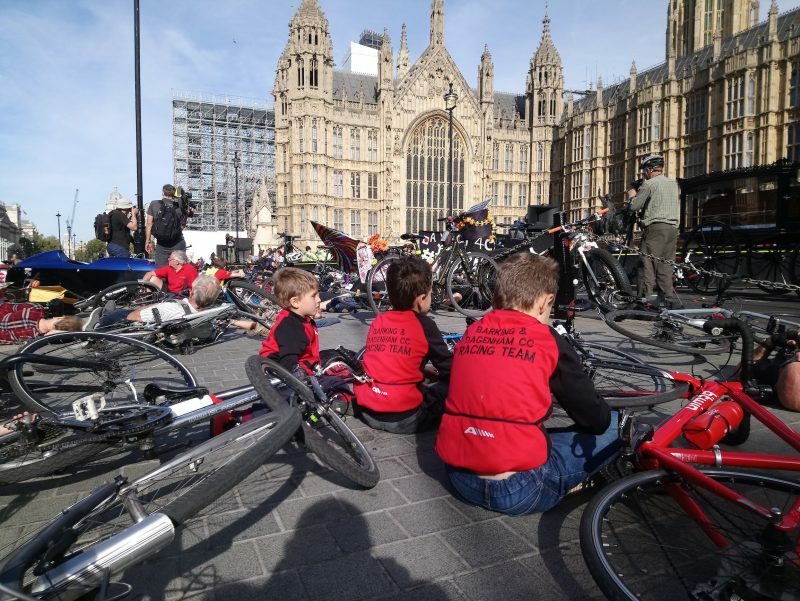 Seeing young kids on the ride made you realise how many roads in London aren’t safe for kids to safely use cycles on. People had been creative with their signs. Some of them really made you stop and think. Outside Parliament the procession stopped and every one laid in silence on the ground for ten minutes in the form of a ‘die-in’. In a city as busy as London it is a disarming sensation to witness so many bodies laying in the main roads. The quietness is noticeable as well, without the constant roar of traffic, and with hushed voices of those passing in respect to the funeral scene, you get to hear, well… peace and quiet. Which in London is rare. We really want safe roads for kids like these to ride their bikes on. 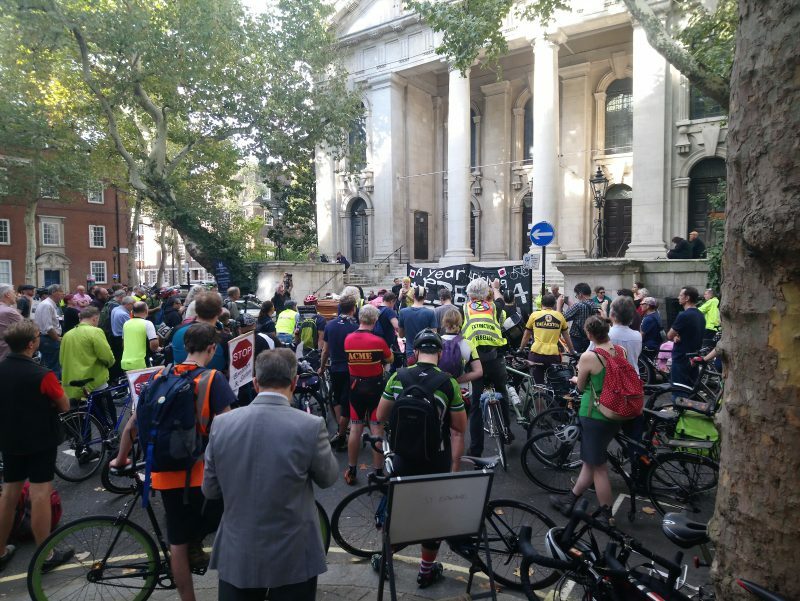 The ride proceeded to St John’s Smith Square for a minutes silence, laying of flowers and then speeches. The flower ceremony was carried out by family members of those lost to road accidents in London and needless to say was very moving. 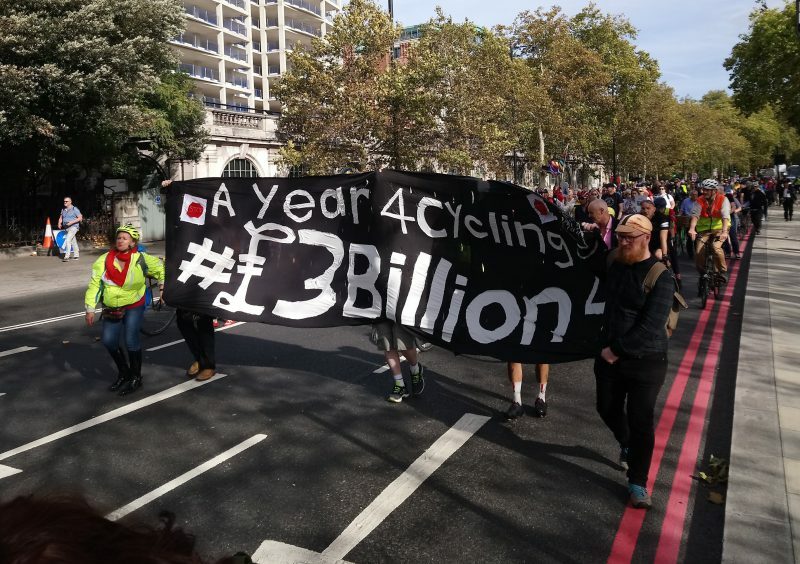 It’s important to note that despite the somewhat macabre name of the campaign group, this is still very much a celebration of cycling. 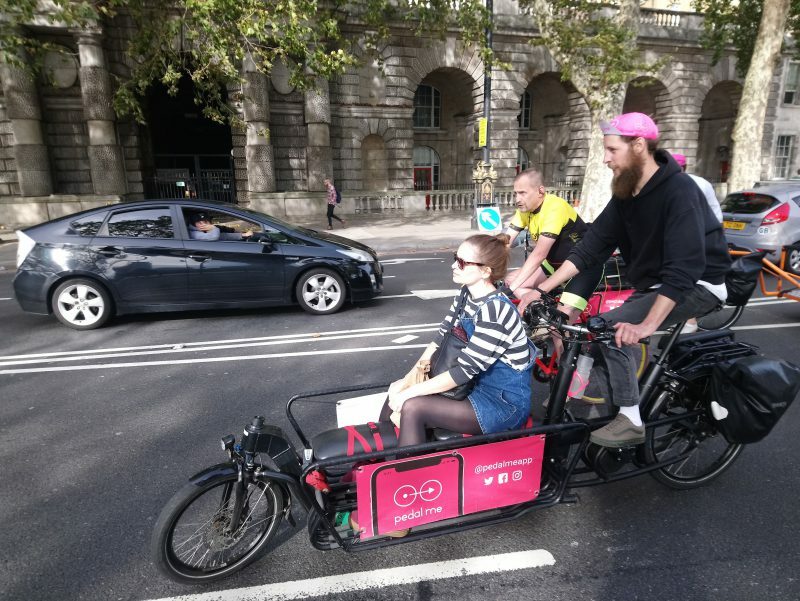 A celebration of the freedom that cycling gives us, a celebration of the health benefits we get from cycling and a celebration of the fact that cycling is the greenest and most eco-friendly way we can all travel. Following the speeches which were very informative and moving, we went to the pub. All in all a very worthwhile afternoon spent on the bike in London. It was interesting to see that the two times we could hear emergency vehicles trying to get by, how quickly cycles can clear the road. 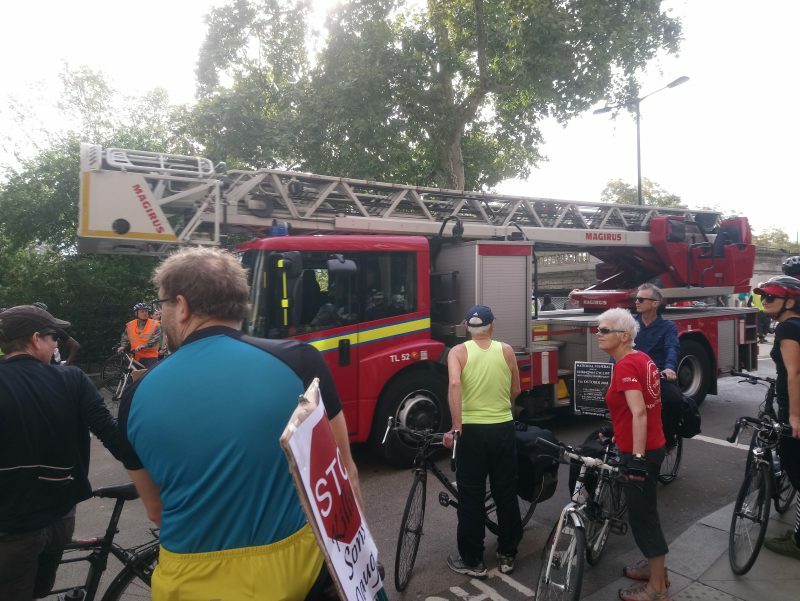 I don’t think the ambulance on the Embankment has ever been able to travel up it so quickly, nor the fire engine that was able to whizz between the parting cyclists. They are not accidents. They are collisions which can easily be prevented with the right infra or with drivers not doing things, often illegal, which put people’s lives in danger. Thanks, I’d struggled with finding the correct language at exactly this point, especially not having seen court reports. Collisions or incidents as the other commenter has used seem more correct, thanks for the corrections. Great piece. I was there today and concur with your views! I think the event was excellent and raised so much awareness. Hopefully it will make people think. It was a lovely sunny day which brought numbers out. 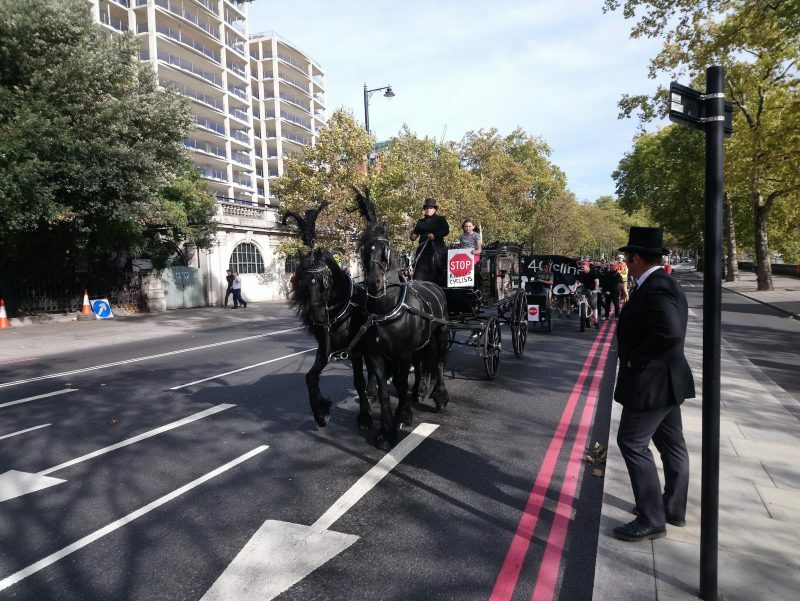 The solemn procession; with the horse drawn hearse followed by the wonderful die-in was really moving. There are two corrections I would like you to make please? I notice you said £1 billion for the new proposed tunnel. I am sure I read it is £7 billion pound as it’s due to be the longest tunnel sprawling over 6 lanes. Induced demand?! I think so. Also, could you use the term “incidents” rather than “accidents” as the latter implies no one was at fault at all.